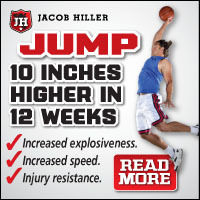 If you’re looking for a fun, fast, and simple basketball dribbling workout, then check this out. It’s called 7 Minute Handles – and it was designed to help you rapidly improve your dribbling skills in just 7 minutes per day. You can do it before school in the morning, while you’re watching TV, or even at lunchtime. In just a few days, you’ll you’ll develop stronger hands and fingers, better ball control, and more confidence with the rock in your hands. Each of the dribbling drills in this circuit are laid out below. Make sure you do them all consecutively, without any break between sets. Hold the ball with both hands behind your back, and your feet shoulder width apart, then bend over at the waist to 90 degrees. Flip the ball through your legs, reach forward quickly and catch the ball in front of your knees. Flip the ball back between your legs, reach backwards and catch it. Repeat for 15 seconds. Same position as the Flip drill, but hold the ball with your right hand in front and your left hand in back. Let go of the ball, switch the position of your hands (right to back, left to front), and catch the ball before it hits the floor. Repeat for 30 seconds. Sit on the floor with your legs spread into a V and the ball between your legs. Dribble the ball in front of you as low and fast as possible, alternating between your right and left hands for 30 seconds. 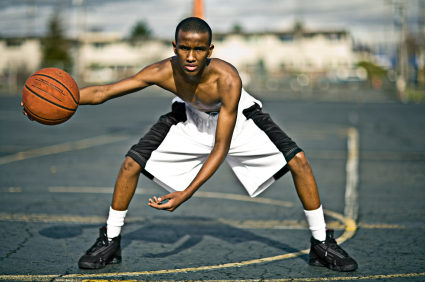 Next, using your right hand only, dribble back and forth over your right knee as rapidly as possible for 30 seconds. Repeat with your left hand over your left knee for 30 seconds. Finally, combine all 3 motions at once, starting outside your right knee with your right hand, dribbling inside your right knee, changing hands to dribble outside your left knee, then back inside again. Repeat for 30 seconds. Stand with your feet spread wide apart, with the ball in your right hand. Dribble in a circle around your right leg, crossover to your left hand, then dribble in a circle around your left leg. Repeat for 30 seconds in each direction (60 seconds total). Grab one basketball in each hand, and begin by pounding them both at the same time simultaneously for 15 seconds. Switch to alternate dribble for 15 seconds. Finally, do a 2-ball crossover for 30 seconds. Dribble nice and high when you’re first learning this one, and keep one ball out further in front to create space. Same position as the Figure 8, but start with a ball in each hand. Begin by pounding both balls at the same time, dribbling with your right hand on the right side, and your left hand on the left side. When you feel comfortable, continue pounding the left ball, while making a circle around your right leg with the right ball. Then, pound the right ball while making a circle around your left leg with the left ball. Finally, dribble the left ball around the left leg AND the right ball around the right leg at the same time. Repeat for 60 seconds. Arms burning? Go ahead and take a break. Haha just kidding. Keep going! You’re almost done. Give this a try and let us know how it goes by leaving a comment in the box below! And if you’re looking for more advanced drills and more basketball dribbling workouts, make sure you check out License To Ball – a complete training system that transforms benchwarmers into stars… and stars into superstars!